When we last talked about Andy, he traveled to Florida to spend time with his Aunt K8. Now, we are turning our attention to the Lone Star State and Ms. Georgette Sullins, hostess extraordinaire. From a chair that swivels and rocks, Georgette shares wonderful stories of her family, past and present. The adventures her grandparents, cousins, parents, etc. experienced are beautifully told by Georgette. I am amazed at the history of her family, and I am certain she’ll share her rich family history with Andy. Something tells me, she’ll enlighten Andy to his own history, too. Andy’s time in Texas will be told throughout the month. Once he departs Texas, he is heading overseas to New Zealand. Let me know if you are interested in showing Andy around your area of town. In the meantime, please enjoy the tale this week. 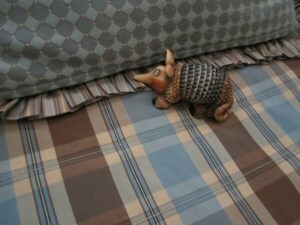 When Lenore first received Andy, there was some discussion about whether he was an aardvark or armadillo. I knew the minute I saw him he was all armadillo, and I immediately invited Andy to TX, where armadillos are a’plenty and where he could meet up with his brothers, sisters and cousins. We Texans know who we are, where we come from. Remember the Alamo!? To be sure about this, Andy now has a Texas passport that will record all the places he visits. This child of LD will have no identity issues…he is definitely an armadillo…a smiling, happy one at that. Andy ARRIVED to TX on Monday, March 5, in a bed of bubble wrap. How very thoughtful of his last hostess, Kate. 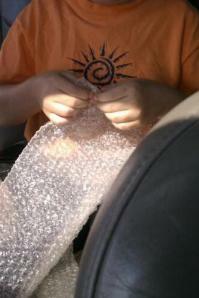 What kid wouldn’t like a bed made of bubble wrap? I was surprised how heavy he is. He’ll be dieting with us. 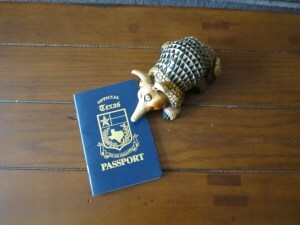 Living in Texas, I’m well aware of the Texas Armadillo lifestyle. 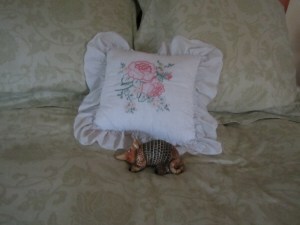 I’m not sure I’d let a Texas Armadillo stay in our guestroom, but Andy is welcome here. OK, Andy, is it going to be blue or…? Hmm… Seems he preferred the green room with the bigger bed. Don’t want any squabbles between T-Bob and Andy regarding snoozing quarters. Rest assured, Andy has his own special place too. I’ll be talking to T-Bob about making visitors feel welcome. That’s all for now. Andy and I will be back next week, as Andy’s Texas Tales continues. Thank you, Georgette!! Andy seems to have settled in nicely. And T-Bob… T-Bob doesn’t seem fazed at all. I look forward to the week ahead. Please send me an email or leave a comment, if you are interested in having Andy pay you a visit. Well…Andy arrived the first week of March and we have been filling his TX passport nicely. Thank you LD for entrusting your little friendly guy with us. First, Houston, then Dallas and finally the farm. 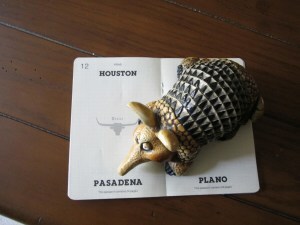 Do get in touch with Lenore Diane’s Thoughts Exactly here, https://lenorediane.com/2012/03/15/andy-armadillo-a-texan-tale/ to show this photogenic guy around. How fun! It reminds me of a schoolassignment where kids take the class pet home and write about their happenings. You and Jolie could go together! Exactly, Mama – it is very much like Flat Stanley. Though Andy is a little more complicated to send traveling. Andy doesn’t fit in an envelope as easily as Stanley. (smile) Thank you for visiting. I am glad you liked this mention of the adventure. 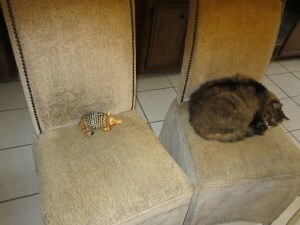 I’m with Georgette – definitely an armadillo. (Although neither “A” animal is very thick on the ground here in Illinois.) T-Bob looks pretty laid back about the whole affair. Laid back? His body language spells ruuuuude to me. T-Bob and I need to have a chat. Pssst….Georgette. If you have any Riesling you might want to hide it. Just sayin’. Oh no…I may have to hide the merlot??? I thought it got low fast. My husband claims I drank the Riesling, but I’m not so sure. Hahahahaha! You gals are funny. What a great idea and a good traveler. I was even more shocked to see Jerry Jeff. I hadn’t heard anything about him since I moved away from the center of the U.S. Glad to see Texas is still on an even keel. Welcome to my neighborhood, Barb. Thank you for visiting. I am glad you enjoyed Andy’s recent adventure. Nice, too, that Georgette was able to pleasantly surprise you with Jerry Jeff. Ooops. I got a bit confused about what was reposted where, but I still think it’s a wonderfully creative journey for Andy A.
Hehehe, no worries Barb. Andy is having a great time, I think. How sweet that Andy has his own chair next to T-Bob. He’s going to be so spoiled by the time he gets to VB! He has a hard life, eh Patti?